Ernand Thierry is a Breton alchemist who sells all manner of alchemy supplies to all visitors at the Caldera Guild of Mages. He has a complete Master's alchemy set for sale, but it's far easier for a starting character just to steal it - it's at the very top of the tower in the Guild Hall, and completely unguarded. Just remember not to try and sell it back to him later. He wears a common shirt with matching belt, pants, and shoes. 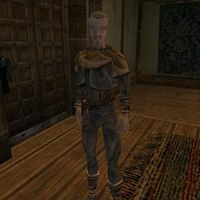 Aside from his natural bonus and resistance to magicka, and his ability to shield himself for short periods, he knows the followings spells: Weary, Tinur's Hoptoad, Summon Greater Bonewalker, Summon Least Bonewalker, Summon Scamp, Commanding Touch, Reflect, Sotha's Mirror, Weak Spelldrinker, Wild Spelldrinker, Vivec's Feast, and Summon Skeletal Minion. This page was last modified on 23 November 2018, at 06:11.